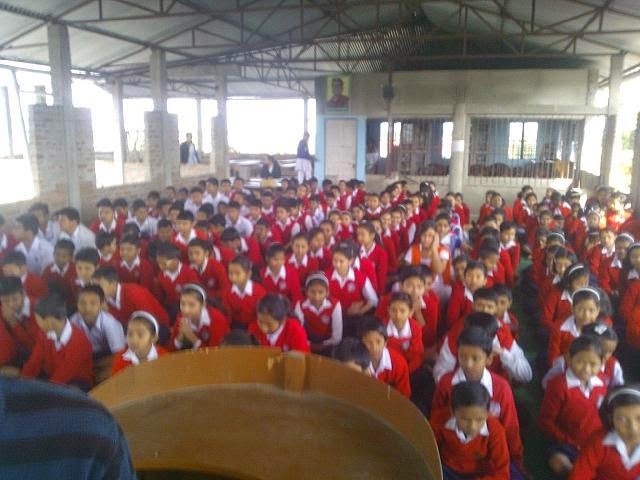 1) Propagation of life and message of Swami Vivekananda among school students: Progation of life and ideology of Swami Vivekananda among the school students through lectures, story telling, games and slogan on Swamiji and Bharat Mata were organized in nine different schools of Dibrugarh. The programs were conducted by the Karyakartas of VK Dibrugarh along with some enthusiastic youths from a few colleges who got associated through MEJSP YUVA Sampark and YUVA convention. 2) Pushpanjali Karyakram: Pushpanjali karyakram before portrait of Swami Vivekananda has been organized in different prominent location within Dibrugarh Town where active participation of local people of that area is observed. The locations are as Thanacharial, Shanti para, Raj Laxmi Banquet Hall, K.P.Road,Naliapool and Paltan Bazar. Near about 650 people offered pushpanjali on the day through above karyakrams. 3) Competitions,cultural program and public meeting: Art competitions for school students,cultural programs and public meeting was also organized in collaboration with few local clubs of Dibrugarh Town.